Flexible, bendable and rollable electronics remain somewhat of a sci-fi dream: making circuitry that continues to conduct electricity while undergoing deformation is actually quite hard. But now there’s a metallic conductor that can stretch to twice its length — and it’s cheap to make, too. The new material, developed at Washington State University, bonds a metal film made out of indium to a plastic layer that’s often used in electronic devices. In experiments, the team managed to stretch the sample to twice its length before it failed. Even then, it was the plastic that actually broke, and not the metal film sat atop it. It’s an impressive feat. While similar results have been achieved with gold in the past, it’s prohibitively expensive to use in large quantities. Meanwhile, cheaper copper has only been shown to be able to stretch by 30 percent in comparable experiments. By comparison, indium is relatively cheap and seemingly incredibly stretchable. 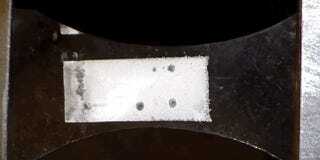 That makes the new material an attractive proposition for flexible electronics. Perhaps we’re edging closer to those sci-fi dreams after all.